COMEDK UGET 2019: Consortium of Medical, Engineering, and Dental, Karnataka (COMEDK) UGET is the exam organized to provide the admission into engineering courses. COMEDK is a state level examination but the candidates from all over India can COMEDK UGET Apply Online for this examination. 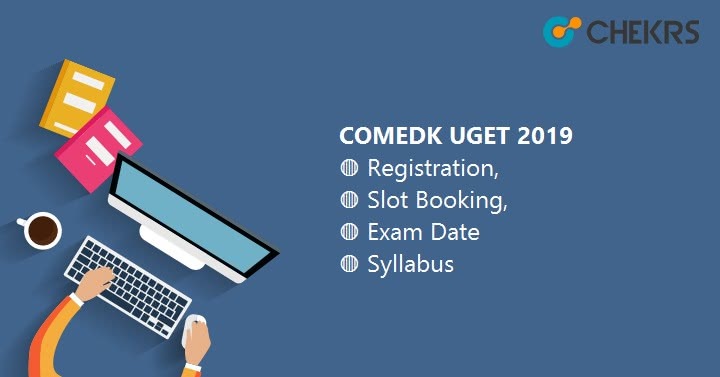 Latest Update: COMEDK UGET 2019 Application Form has been released Today. Check Last Dates and procedure below. Latest Update: COMEDK UGET Exam date Announced Check Dates in the table. It is the admission test conducts for providing admission to undergraduate engineer’s courses. For the candidate who is preparing for the Consortium of Medical, Engineering and Dental exam have to start preparing for the exam. For the simplification of the candidate, we provide here the all the information regarding the COMEDK UGET. The COMEDK UGET will release the exam date from the month of January (expected). Candidates who are interested can apply for the exam from the third week of January. The other details regard the COMEDK UGET 2019 Exam Date is provided below in the table candidate can prefer this table for the simplification. Applicants who are applying for the COMEDK UGET is required to full-fill the eligibility criteria. Aspirants make sure that if they are not eligible they will not allow sitting in the exam. The COMDEK UGET 2019 Eligibility Criteria is mentioned below. Nationality: only those students who are Indian Citizens can apply for the COMDEK UGET. Education Qualification: applicants who are applying for the COMDEK UGET must fulfill the education criteria. The criteria are given below. Name of the Applicant: Candidates have to enter the name same as there in the 10th, SSLC mark sheet, the date of birth as per 10th /SSLC scorecard. Candidates have to enter the valid E-Mail ID and the mobile number for the future conference. Applicant must have the unique ID proof. The ID Proof includes the voter ID, Aadhar card, Passport, Driving License. Note: – These are the general requirement fill by the candidate while doing the registration in the COMEDK UGET. It is mandatory to fill the all the blocks asked during the application form filling. The E-Mail ID and the phone number provided by the candidate during the registration must remain same till the admission process. The E-Mail which is used for the registration once cannot be used again. After filling the all the information in the application form, candidate is required to check the whole detail before click on the submit button. When the registration is done successfully, the candidate will receive a unique ID and password for completing the application form. After that candidate has to log in with the unique ID and password to complete the application process. Use to an appropriate version like Internet Explorer 10, Mozilla Firefox 48 and above or Google Chrome 50 and above to fill the application form. The COMEDK Slot Booking of the COMEDK UGET will be available to those candidates who have successfully submitted there COMEDK UGET Forms. If the candidate once booked is not able to change the slot under any circumstances. Candidates are required to pay the entrance fee for booking the slot. For the candidate who has successfully booked their scheduled will receive the confirmation mail. For the candidate who is preparing for the COMEDK UGET have to know the syllabus and the exam pattern. For that simplification, we provided here the detailed COMEDK UGET Syllabus. Candidate can prefer this for the preparation of the exam. The aspirants who will go for giving the exam of the COMEDK UGET 2019 is required to get their admit card on their examination. The COMDEK UGET 2019 Admit Card will be available on the official site. It is necessary to take the admit card during the examination. Candidate makes sure that without the admit card they will not allow to sit in the exam. The COMEDK UGET Admit Card contains all the details such as the name of the examination center, exam timing, candidate name etc. So it is necessary for the candidate to bring the admit card during the exam. After giving the exam aspirants are very curious to know the answer mark by them. The COMDEK UGET 2019 Answer Key is available online after the exam in finished on the official site. Candidates who mark the answer can check their answer through the answer key released by the COMDEK UGET on their official site. The result of the COMEDK UGET declares in the online mode on their official site. The candidates can see their result from their login IDs. The COMEDK UGET Merit List 2019 is released on the basis of performance done by the candidate in their exam. Those candidates who will clear the exam only those candidates will able to get the scorecard and are eligible for the UG courses under the engineering field. The cut off marks are the minimum marks which is required to score by the candidate in their exam. Aspirants who gain more marks than the cut off marks is selected for the counseling round. The COMDEK UGET 2019 Cut Off Marks is released by the official’s members after the 2-3 days of the result declaration. The COMEDK 2019 Counselling will be organized by the Centralized counseling for admission to the engineering & architecture Courses. The counseling is conducted in the offline mode. During the COMEDK UGET Counselling applicant requires to bring the original documents along with the photocopies for the verification purpose. The information provided here is as per the official notification if the applicants face any of the problems for the registration in COMEDK they can go to the official site. If they have any further queries they can contact us through the comment box. The COMEDK UGET will release the exam date from the month of January (expected). Candidates who are interested can apply for the exam from the third week of January. The other details regard the COMEDK UGET Exam is provided in this article so start your preparation from Today.